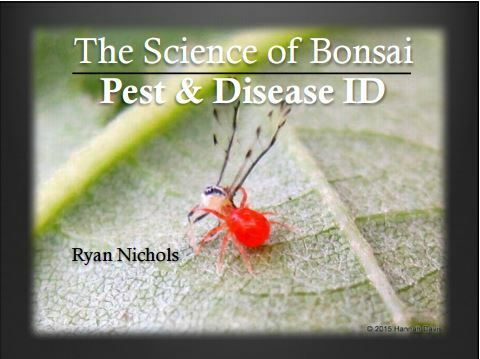 Ryan Nichols gave us some of the science and sensibility behind bonsai pest and disease management at our April meeting. With a background that includes many years as a turf specialist, Ryan considers soil health to be of paramount concern for all horticulture, including bonsai trees. Like many of our favorite speakers, Ryan used a top-down approach in his lecture, beginning with some thought-provoking questions about how we define plant health and what factors contribute to its improvement or decline. He pointed out that his soil-focused approach runs counter to common horticultural thinking, which tends to focus almost entirely on foliage, a little on roots, but very rarely on the soil. This is primarily for the unsurprising reason that the soil is simply less accessible. Ryan says that the reverse priority, with soil as our principal concern, has much more to teach us. His explanation centered on soil microbiota, particularly fungi, with mycorrhizae as the prime example. We’ve heard a little about mycorrhizae from other speakers, but Ryan gave some more specifics and recommendations. If you’ve heard of mycorrhizae before, you probably know that they’re a family of white, webby fungi that help make more nutrients in the soil available to the roots of your plants. For instance, they help convert nitrogen into a form that plants can more easily absorb. Ryan pointed out that mycorrhizae also support the roots by extending their reach. The mycorrhizal hyphae network grows much more quickly than roots, and any water and nutrients they reach are shared with the roots to which they are attached. That is why Ryan strongly recommends using a bacterial/fungal inoculation for new soil and for any soil that you have been forced to treat with chemicals. Anything killing pests or diseases is probably killing your beneficial soil microbiota as well. 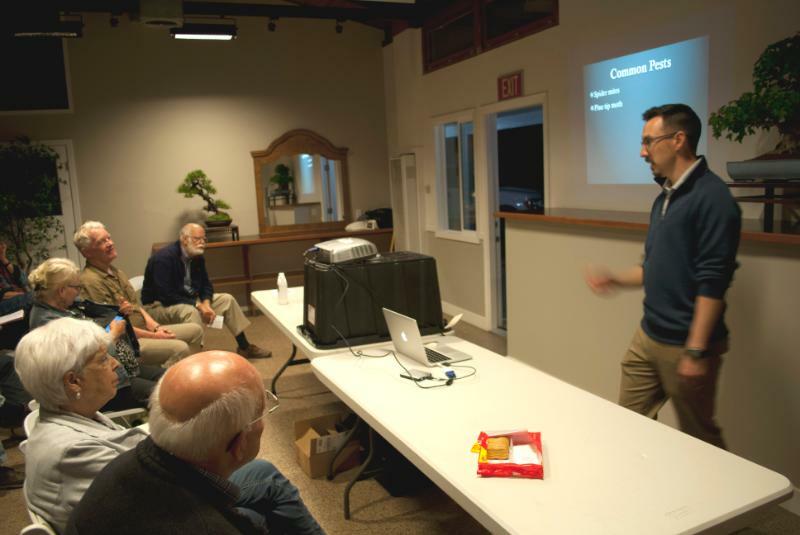 Ryan concluded with a discussion of common diseases and the typical pests encountered when growing bonsai, followed by some discussion of, and comparisons among, the various products available to mitigate them. These and other details from Ryan’s talk are available to members who request them at info@marinbonsai.org. You will be sent a copy of the detailed slides Ryan used for his talk. May all your bonsai schemes sprout properly this May.